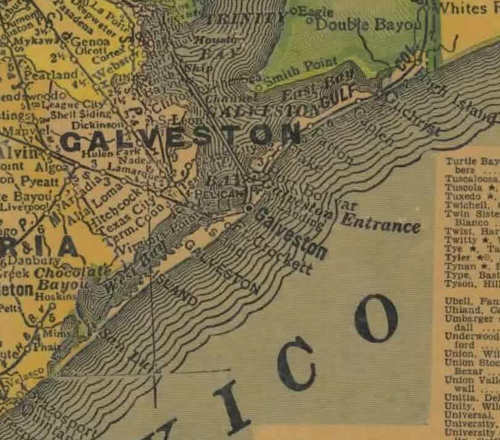 Galveston Island, for centuries a crossroad for Indians, privateers, Spanish and French explorers, for a time was capital of the Republic of Texas. This was during the Texas War for Independence, when Santa Anna was making his 1836 invasion. On March 17, the hastily organized ad interim Cabinet of President David G. Burnet evacuated Washington-on-the-Brazos, moving to Harrisburg, and then in April to Galveston. Here it remained until after the Texas Victory at San Jacinto on april 21, 1836. 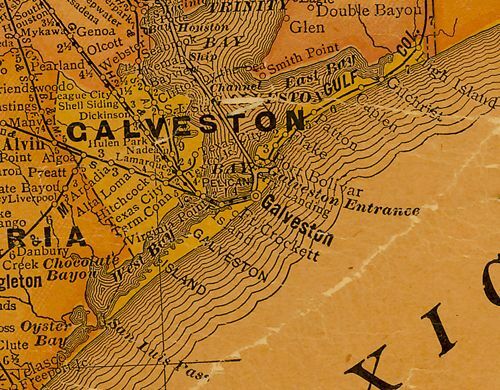 From January, 1836 until U. S. annexation in 1846, Galveston was the naval base for the fleet which protected shipping and sought to prevent Mexican invasion of Texas by way of the sea. By September, 1837, the four ships of the Texas Navy had all been lost. Not until April, 1840 was the Navy reorganized, under President M. B. Lamar. A former U. S. Naval officer, Edwin W. Moore, was made commodore. Afterward, when Moore became involved in a bitter controversy with President Sam Houston, Houston ordered the Navy to be sold. At the sale, the incensed people of Galveston used forceful means to prevent bidding. The ships at annexation were all transferred to the U. S. Navy. The revival of economic, political, social and religious institutions in Galveston County following the Civil War was more rapid than anywhere in the South. 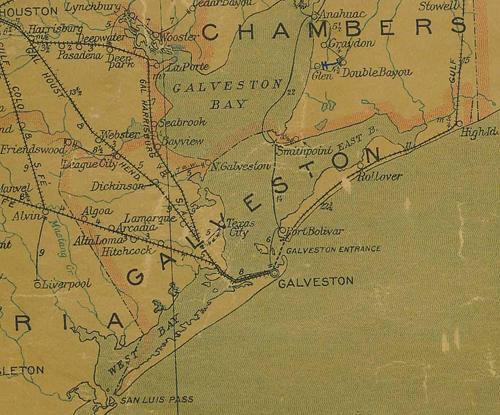 Galveston emerged as the largest city in Texas and with its natural seaport, became the focal point for sea and railroad transportation. The Gulf, Colorado and Santa Fe Railroad was established. Wholesale grocery firms were established and cotton compressing firms were founded. The first electric lights used in Texas burned in Galveston and the first telephone in the state was installed. The city also became known for its beaches, fishing, palatial homes, flowers, palms, resorts and public schools. The greatest single development of the port occurred in the 1870s when the outer channel was dredged to a depth of 32 feet, sufficient to accommodate all ocean-going vessels. On the mainland, Shoal Point succeeded the Austinia settlement and became a permanent colony in 1894 when a group of land developers named it Texas City. During this period, Galveston was hit by three catastrophes -- a yellow fever epidemic, a fire in 1885 and the 1900 storm. Some 6,000 lives were lost in the hurricane. The citizens were determined to rebuild the city and a seawall was constructed by Galveston County, followed by an enormous city grade-raising project. The first city commission form of government was founded and was later adopted by municipalities throughout the United States.